On the 3rd (Sat), hike the day away at Bright Angel Trail. Next up on the itinerary: hike along Rim Trail, don't miss a visit to Grand Canyon Village, get great views at Hopi Point, and tour the pleasant surroundings at North Kaibab Trail. 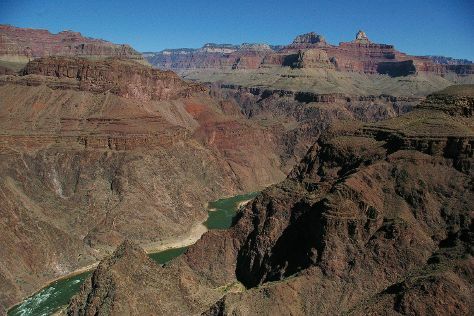 For photos, traveler tips, reviews, and more tourist information, refer to the Grand Canyon National Park trip planner . Toronto, Canada to Grand Canyon National Park is an approximately 33-hour car ride. Traveling from Toronto to Grand Canyon National Park, you'll gain 2 hours due to the time zone difference. Traveling from Toronto in August, plan for slightly colder nights in Grand Canyon National Park, with lows around 11°C. Wrap up your sightseeing by early afternoon on the 8th (Thu) to allow enough time to travel to Jackson. Jackson is a city located along Interstate 94 in the south central area of the U.S. Change things up with these side-trips from Jackson: Lansing (9-11-2001 Remembrance Memorial & Potter Park Zoo) and East Lansing (Michigan State University & 4-H Children's Garden). There's much more to do: get your game on at EpIQ Escapes, delve into the lush surroundings at Dahlem - Jackson's Nature Place, stroll through Falling Waters Trail, and explore the activities along McCourtie Park. Plan my trip to Jackson with suggested itineraries provided by Inspirock. Explore your travel options from Grand Canyon National Park to Jackson with the Route module. The time zone changes from Mountain Standard Time (MST) to Eastern Standard Time (EST), which is usually a 2 hour difference. Traveling from Grand Canyon National Park in August, Jackson is somewhat warmer at night with lows of 17°C. Wrap up your sightseeing on the 11th (Sun) early enough to travel to Detroit. Explore the numerous day-trip ideas around Detroit: Ann Arbor (Decode Ann Arbor & Ann Arbor Hands-On Museum), Paint Creek Trail (in Rochester) and Macomb Orchard Trail (in Richmond). There's much more to do: examine the collection at The Henry Ford, admire all the interesting features of Comerica Park, step off the mainland to explore Belle Isle Park, and take in the waterfront at Detroit RiverFront. To find traveler tips, more things to do, reviews, and more tourist information, read our Detroit day trip planning website . You can drive from Jackson to Detroit in 1.5 hours. In August, daytime highs in Detroit are 32°C, while nighttime lows are 20°C. Finish your sightseeing early on the 16th (Fri) to allow enough time to travel back home.